Lotus Racing secured its primary goal of tenth place in the 2010 FIA Formula One World Championship when Heikki Kovalainen finished the Abu Dhabi Grand Prix in 17th place. Jarno Trulli's race came to an unfortunate end on lap 51 and finished in the garage after his car suffered a rear wing failure with just three laps left. 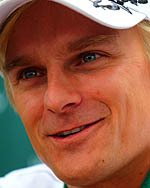 Heikki Kovalainen: "What a fantastic end to our season. The race itself was just great, right from when the lights went out. I got the best start of the season, made up places immediately and from that point on I just got my head down and got on with it. Everything went perfectly according to plan. The tyres weren't really degarding and as the car got lighter and the fuel burnt away I was able to keep putting in what felt like qualifying laps throughout the whole race. I was able to pull away a gap to the cars behind me and we managed the traffic really well all race. After I came out of the pits I had to let a few cars past which cost me several seconds, but that wasn't a problem as I could keep pulling away from my direct rivals. This is the perfect way to end our first season, and gives us a huge boost for next year. We finished on a high, achieved all our goals and we have a very exciting future ahead of us. Thank you to the whole team for a fantastic season - I can't wait for next year." Jarno Trulli: "First of all congratulations to the whole team. Everyone has done an amazing job this year and while it's been long and tough, for a brand new team it's been special. My race was one of the ones I'll want to forget. I had a problem with the front wing to begin with, and then a rear wing failure finished the race so I'm pretty glad it's over! This year I've had all sorts of bad luck but I'm very confident about next year as the package that's been put together is very good and it gives everyone in the team a chance to take the next step forward." Mike Gascoyne, Chief Technical Officer: "Job done. When we started out on this project the first target was to be best of the new teams. When you think how late our entry was confirmed that was always going to be a good challenge, but we have done it. We gave Tony, Din and Nasa tenth place and that makes me very proud of the whole team. On a personal level I'd like to thank my partner Silvi. We did this together and I could not have done it without her or the whole team. However, this is just the beginning. Next year what is important is the steps we take forward, but for tonight we will enjoy the achievement. We have earned it." Tony Fernandes, Team Principal: "I am completely relieved, completely ecstatic, completely happy and completely vindicated in making the decision to go into F1. What we have achieved today is what dreams are made of. To complete 19 races after having just five months to build a car and finish in tenth in style is something that is truly magical. It shows you that even in the modern age where money and power counts for so much, there is a chance for ambition and dreams to shine. 2010 is a year that we can be proud of. We brought Lotus back into F1 after many had talked about it, but we did it. I can confidently say that everyone associated with the Lotus history can be very proud of what we have done this year. This is the first chapter of a long career ahead and we will create our own future, destiny and history from here. I am thankful to all the incredibly special staff we have in Hingham, Malaysia and here in Abu Dhabi for what they have done this year and my abiding memory of 2010 comes from one of our engineers, who told me he had achieved higher grid positions with other teams, but never with a team that feels as special as this. To all the Lotus fans thank you so much for your support - we could not have done it without you. I am thrilled that Lotus Racing has opened up F1 to everyone out there, and we cannot wait to see you next year."